Eleanor Travica studies a black-and-white photo of the day shift at the Danube mine in Bovey in 1945. 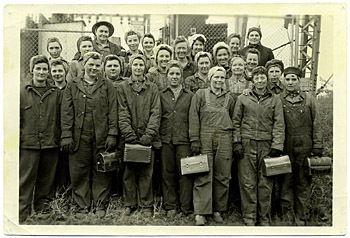 Twenty-four women stand up straight in their overalls and boots, their hair pulled back under scarves or hats, their lunch pails in their hands. Travica worked at the mine in 1944 and 1945. She worked eight hours straight, with no break for lunch or coffee. She ate while keeping an eye on chunks of iron ore tumbling out of a crusher onto a wide belt. The belt snaked down three stories through the plant where the ore was washed and dumped into railroad cars and shipped to steel plants to the East. "On each floor they could stop the belt, but only up on the top floor was where they could start it," Travica says. When it went smoothly, all she had to do was watch. If it got jammed up, it had to be stopped and started again. Other women were responsible for shoveling up the ore that fell off the belt and throwing it back on. That's where the female crew outshone the men, Travica remembers. "Each shift the women made sure that everything was clean under the belts. But when just the men were there, it would spill over until it couldn't drag any more, and then they had to stop to clean it out. So they were thankful for the women," she laughs. And the women didn't stop there. They washed the windows that were caked with dirt from years' worth of wet iron ore. "And this foreman said to me, 'The first thing I know, you'll be wanting to put curtains up here!'"